North Yorkshire is England’s largest county and one of the most rural comprising of the Yorkshire Dales, North York Moors, Vale of York and the coastal regions and they all have their own distinctive natural beauty. The county covers an area of 3,341 square miles and 40% of this area is covered by National Parks and with stunning moorland, beautiful dramatic to rolling hills, ancient woodland, a spectacular coastline, splendid waterfalls, many attractive villages and hamlets and many historic sites such as abbeys, castles, priories, stately homes and traditional pubs there is something for everyone of all ages to explore. The Yorkshire Dales is an upland area of Northern England spanning westwards from the Vale of York, over the Pennines and into Cumbria. Known mainly as The Dales it has outstanding scenery, a diversity of wildlife habitats, a rich cultural heritage and peacefulness. The Yorkshire Dales National Park, created in 1954 and one of fifteen National Parks in Britain, has over twenty main dales each with their own unique character and atmosphere. Most of the dales are named after their river or stream except Wensleydale which is named after the small village and former market town of Wensley rather than the River Ure. The Northern Dales are rugged and the Southern Dales are less remote but the dales, so beautiful, are littered and scared with ancient settlement sites, disused mineral workings, dry-stone walls and barns. The U and V shaped valleys, formed by glaciers, are mainly grazed by sheep and cattle and provides the hills for walkers and climbers and the valley bottoms for strollers and amblers. Reeth is a beautiful village in Swaledale with the River Swale flowing just to the south of the village. Reeth is known as the capital of Swaledale and is situated at the meeting point of two of North Yorkshire’s finest Dales, Swaledale and the most northerly Arkengarthdale, the latter relatively unexplored and one of the more tranquil dales. Reeth’s 18th century houses and three pubs /hotels are clustered around a triangular green and the village also has four tearooms, a bakery, ice cream parlour, a shop, a post office, many B & B’s and a market day on Fridays. In May and June the annual two week Swaledale Festival is held bringing many visitors and locals to Reeth to enjoy the small scale music and guided walks and every year on the last Wednesday of August the agricultural Reeth Show is held. 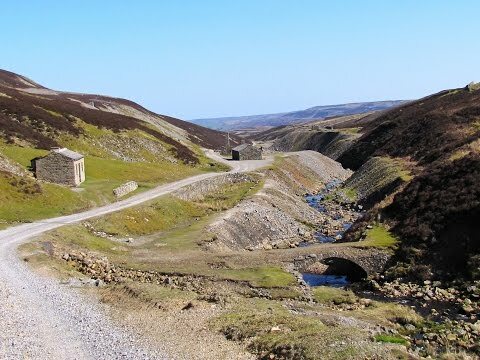 Reeth is over looked by the fells of Fremington Edge and Calver Hill and is a great starting point for several of the North Yorkshire Dales best known walks one being Fremington Edge which after a steady climb provides fabulous views of Swaledale. In the 18th century Reeth became a centre for hand knitting and was the capital of the lead mining industry, but it was always a market town for the local farming community. Surrender Bridge is an old stone bridge over Old Gang Beck connecting Swaledale and Arkengarthdale. Great Pinseat at 583 metres (1913 feet) sits to the north of Swaledale on Reeth High Moor. Even though it is a beautiful walk through old lead mines to the top of Great Pinseat its summit is nothing spectacular just rough grassland with a trig point and a boundary stone on the other side of a wall. There is much evidence of mining in this area and was one of the most intensively mined parts of Swaledale in the 18th and 19th centuries. The old disused building seen from Surrender Bridge is the remains of Surrender Smelt Mill. Old Gang Smelting Mills is the largest remaining lead smelting mills in the Yorkshire Dales. It began smelting in 1797 and took place on this site until 1907. The earliest mill at the rear of the site was known as New Mill and the larger mill, known as Old Gang Mill, began smelting around 1846. The valley is said to have held the biggest concentration of lead smelting mills in the country so for over 200 years the valley was a height of activity but today it is a wonderful peaceful place popular with walkers and cyclists. Well worth exploring. Reeth High Moor is grazed by many sheep and grouse shooting in Swaledale has been carried out for over 150 years. From the car park at Surrender Bridge we turn right over the bridge and walk uphill along the road. We ignore a footpath sign on the right and continue to the brow to take the bridleway on the left for Level House Bridge. We now follow the track slightly uphill passing the grouse butts on our left and continue uphill ignoring any paths going off right or left. We pass a sheep fold on our right and keep heading forwards towards the spoil heaps in the distance. When we reach the spoil heaps and a cairn (you can turn right here over the rough grass to meet the wall where on the other side is the trig point and boundary stone marking the summit of Great Pinseat) we continue forwards bearing left through the spoil heaps towards the large cairn on top of a spoil heap in the distance. At the large cairn we bear left at the small cairn and then right now starting to follow the track downhill. When we reach a gate in a wall we go through and cross over a small stream then continue following the track downhill with the stream on our left. We pass two shafts on our left and soon cross over the stream again now on our right. At the stone bridge on our right we keep heading forwards through a gate. We continue downhill and at a fork we keep right on the lower path. We then pass through the ruins of the Old Gang Smelting Mills and continue forward uphill following the main track, ignoring any paths going off to the left or right, then downhill to Surrender Bridge. This is an easy to moderate walk on good gravel and stony tracks. Some quiet tarmac road and also some gentle inclines and declines. Approx 5.75 miles allow 2½ to 3 hours using OS Explorer Map OL30 Yorkshire Dales Northern and Central areas, Wensleydale and Swaledale. This walk is Anti-clockwise. Start point: Surrender Bridge approx 4 miles west of Reeth in Swaledale in the Yorkshire Dales. Reeth High Moor west of Reeth and Healaugh in Swaledale in the Yorkshire Dales. From the A1(M) take the A684 to Bedale. At the t-junction in Bedale turn right for Layburn. At the small roundabout at Layburn turn right and then left for Reeth. At the cross roads cross straight over and follow the road over the top and down to Grinton turning left at the t-junction onto the B6270 into Reeth. Continue through Reeth on the B6270 then just after passing through Healaugh take the first turning on the right onto a small road, this leads to a t-junction, Surrender Bridge and car park. OR from the A1(M) and A66 junction take the A6108 through Richmond, carry on bypassing Marske and then take a right turn onto the B6270 to take you to Grinton then Reeth. Continue through Reeth on the B6270 then just after passing through Healaugh take the first turning on the right onto a small road, this leads to a t-junction, Surrender Bridge and car park. Parking: Free car park at Surrender Bridge. There are no public toilets the nearest ones are at Reeth near the Buck Hotel and also at nearby Grinton. For refreshments there are four hotels/pubs The Black Bull, The Buck, The Kings Arms and The Burgoyne, four tea rooms, bakery, ice cream parlour, restaurant /diner, a small convenience store and on Friday evenings there is Ramsey’s Fish and Chips mobile van. There is also a pub at Grinton, The Bridge Inn.